Old habits die hard. If you want people to try a new technology like mobile remote deposits, it may take cash bribes. Numerica Credit Union paid members $5 each to do just that. To teach people how easy it is to deposit checks using a smart phone, the credit union gave $5 checks away to those participating in live demonstrations. Having trouble getting customers to use mobile check deposit? Numerica Credit Union found a relevant and elegant solution: handing out $5 checks to those members willing to give the service a whirl. Once users accepted the $5 check to test out the application, “they not only learned how easy it was to deposit a check using their mobile device, but the $5 was theirs to keep,” said Heidi Curnow, Marketing Manager at Numerica. The idea to use real cash demo checks is so simple that one could easily dismiss its strategic magnitude. For starters, it’s strategically intuitive; obviously live demos fuel higher adoption rates of new tech. Thus, when a financial institution wants to roll out a new feature like remote deposits, it helps to use real cash as part of the demonstration. But it’s much more than that. Indeed, this little $5 bribe could serve a major role in your mobile strategy. 1. Savvy Users – Those who utilize a wide array of mobile banking features, often younger consumers who are both early adopters and heavy users. 2. Single-Feature Users – Those who only like/need/use online banking for a single feature, like checking their balance or making remote deposits. Every retail financial institution wants more savvy mobile users. The easiest way to accomplish this by turning single-feature users into savvy users — encouraging them to integrate more mobile behaviors into their financial lives. That means banks and credit unions will need to be continually growing their base of single-feature mobile banking users. You could think of it as a “mobile banking lifecycle,” where the majority of the population starts out as single-feature pups on the path to becoming power-using lions. This, in turn, means financial marketers will be focusing a lot of energy on new mobile banking features as they are launched. You could have an in-branch display with a pad of pre-printed, tear-off checks. Redemption instructions and a remote deposit how-to can appear on the back. The display doesn’t have to be this complex (granted, this merchandising idea is a bit radical); a poster would work just fine. Also, branch staff should be encouraged to use these checks in live demos with new and current accountholders. …and whammy! 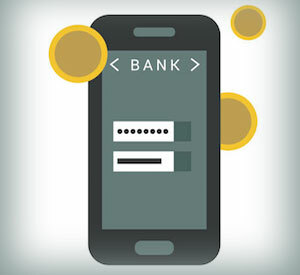 You’ll have yourself a whole new stream of mobile banking users pouring in. Yes, many will be single-feature users, but you’ll have a plan in place for getting them fully onboard the mobile channel. You should also be able to easily target branch-based depositors through your transaction records. You could send each and every branch depositor a $5 demo check in the mail, along with instructions. If they have any questions or need help, they can bring their phone and check into a nearby branch (with the branch’s address printed on the check). 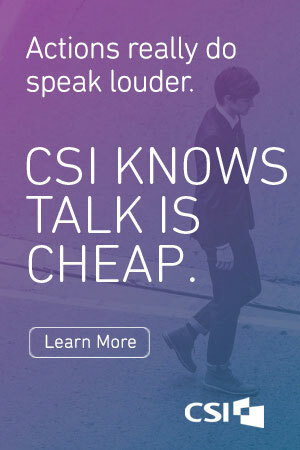 Or they could call a dedicated tech support specialist. Or follow an online tutorial. Key Question: Do you think your organization would see the value in paying people $5 to try a delivery channel that directly reduces the volume of costly branch transactions? How many remote deposits would it take before the service paid for itself? The $1.2 billion Numerica allocated around $100,000 to promote mobile banking and “remote deposit capture” (RDC). 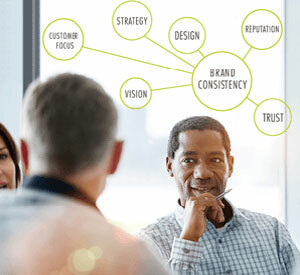 That’s about 5% of the credit union’s total annual marketing budget — nothing to sneeze at, for sure. Numerica’s big mobile push includes ads placed across a range of media, including radio, TV, online, newspaper and in-branch merchandising. Numerica’s first buy ran for six weeks with print once a week, radio and TV seven times a week with over 1.6 million impressions. Another print-online buy is planned in one market area to run six weeks with the same frequency. But the credit union wanted to do more than traditional media. “So we decided to hold special demo parties at some of the most popular restaurants and pubs in the area,” explained Curnow. 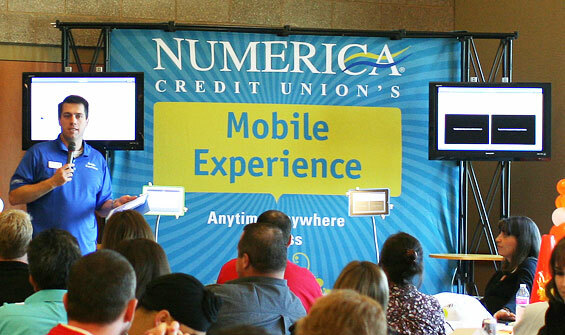 For these live demonstrations, Numerica constructed an 11’ x 9’ booth complete with TV screens, allowing them to showcase remote deposits in action (among other mobile banking features). Dubbed the “Mobile Experience,” the booth travels to busy locations around Washington state — like sports venues, college campuses and home and garden shows. “From the marketing perspective, we began our approach with the events, trying to generate some buzz, and then we layered in traditional media,” Curnow said. So far, there have been at least 15 “Mobile Experience” events, with each stop lasting two- to six hours. The marketing team at Numerica also hatched the idea to have afternoon “Happy Hours” in branches, where the booth could be used to host mobile deposit demos when it wasn’t booked for other venues. Since launching on September 1, Numerica reports $839,000 in total mobile deposits drawn from 2,400 checks. In just the first two months following the debut of the newly enhanced mobile banking experience, the 90,000 member credit union had added nearly 1,000 new mobile users who deposited 1,500 checks worth $540,000. Not too shabby, even for a credit union with $1.2 billion in assets. Since first diving into mobile banking in early 2011, Numerica has seen at total of 13,285 (14.8%) of its members sign up. On its website, Numerica proudly boasts that it’s keeping up with big banks like Chase and BofA in the mobile banking arms race. Numerica’s line-up of features includes mobile bill pay, text pay and remote check deposit. The credit union also runs a comparison with those of regional banks and competitor credit unions. Numerica says its mobile RDC and text banking features are provided by ProfitStars, a Jack Henry unit. The bill payment component is provided by PSCU. Both the mobile payment app and web bill payment work along similar lines. A user submits the deposit for execution and then receives an email confirmation. There is a monthly limit of 20 checks on the mobile RDC service. Numerica so far is pleased about the immediacy of deposit posts. It has avoided longer wait times for batch posts though there are holds for larger deposits. This article was originally published on November 28, 2012 . All content © 2019 by The Financial Brand and may not be reproduced by any means without permission.